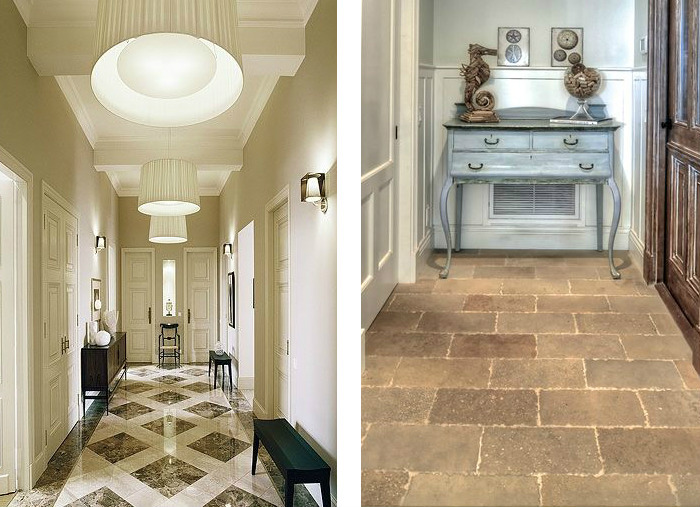 The natural stone for decorating an apartment hallway, a small house or a bigger villa solves a lot of things, of which durability comes first. 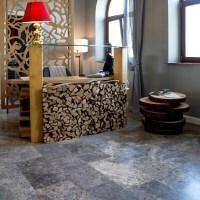 If natural stone durability (far superior compared to ceramic tile in the hallway!) is acknowledged, we will insist a little on diversity. 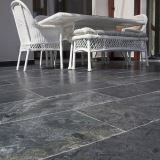 Natural stone, as it is known, comes in a very wide range. This diversity is attributed to the structure of the rock, its color, the processing method, the size of the final product. 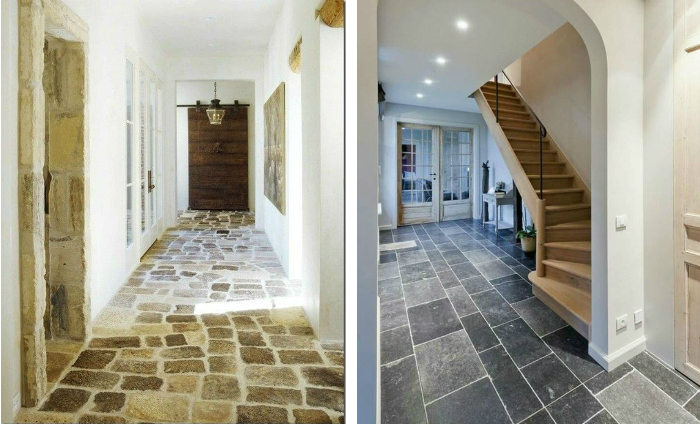 Thus, we have tiles with more, less, or none at all textures, with a rich color variation or single color, glossy, honed, tumbled or bush hammered ... What is the instant consequence of this wide range of solutions offered by natural stone for decorating a hallway? Regardless of the interior or exterior appearance of your house, you will surely find a natural stone that integrates perfectly with your house setting. In Romania most hallways are small, whether we are talking about entrances to apartments or houses. Depending on the rest of the home, the flooring can be brushed and chiseled, honed or polished. We left polishing (marble, travertine or slate etc.) at the end because it can scratch over time due to the stones and dust carried in from outside. This is true for houses where you enter directly from outside and no so common for flats. Anyway, with a little care and a soft rug placed at the door, a polished floor remains a perfect solution for those who want an elegant, classic interior design. 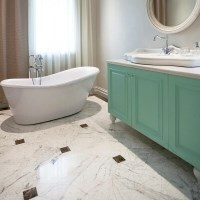 Many Romanians prefer the classical, glossy approach to flooring, often using gray, white or black marble, granite, or one of the many types of travertine. A glossy floor in a rather modest space such as a hallway implies from the beginning, an extra caution when managing the polished surfaces. Some chrome elements may still be present, but a shiny wall, if any, will need to be well balanced in terms of light. We do not have to fully illuminate this polished marble wall, for example, but we will have to play with delicate light beams. Considering the modest space, we believe that a glossy floor can be associated with a natural stone wall of the same color but with a different texture, spliface for instance. 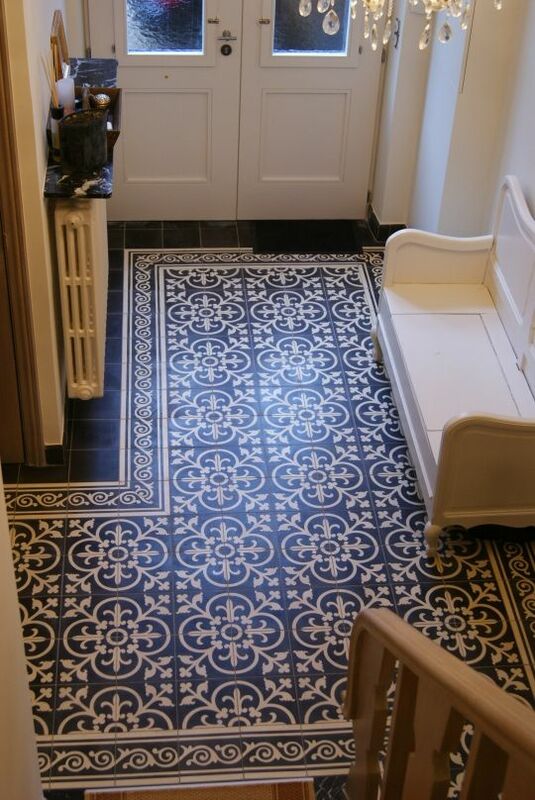 If the decoration project for a classical-elegant hallway comes is instantly associated glossy tiles, brushed, chiseled or tumbled surfaces represent another method, so frequently used not only in Romania but all over the world. 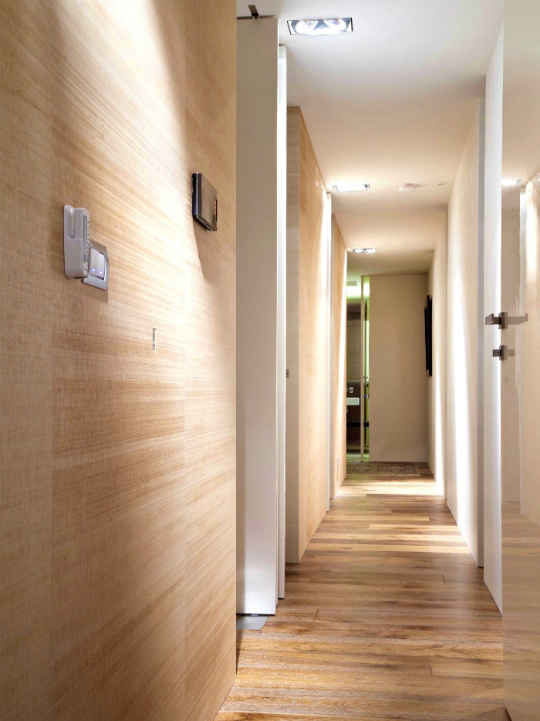 Obviously, a hallway with such flooring must keep its traditional, rustic or Mediterranean air, and glossy surfaces will no longer play such an important role. What can be combined in a large space is unlikely to produce the same results into a reduced space. When you decide to decorate your home with natural stone, it is easy to understand why ceramic tile flooring in the hallway is out of the question. 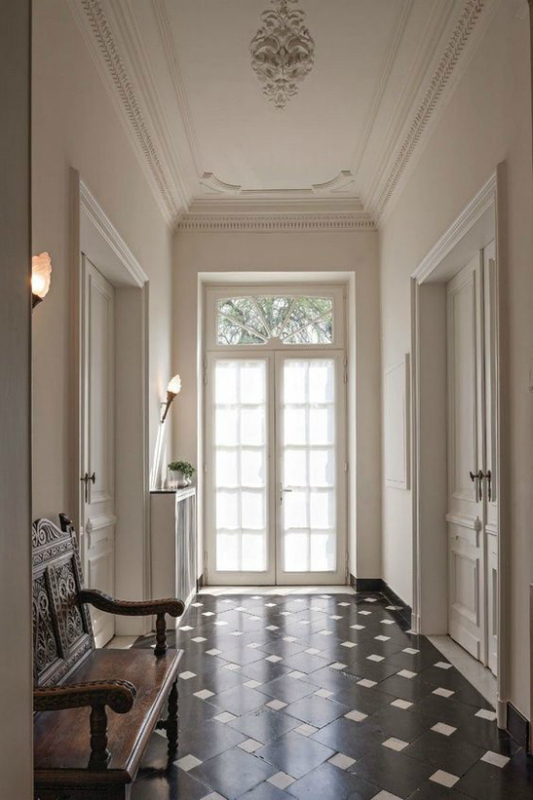 For the unconventional customers, terrazzo tiles have always been accessible ways to embellish and bring dynamic into a modest space, such as the entrance hall. The color variation of these terrazzo tiles opens the way for many combination in terms of color and on the other hand, can very well delimit the rooms. This "territorial" separation plays an important role when decorating a smaller home, because, if well-conceived, this strict separation will create the feeling of a larger, more spectacular home. However, carefully consider the passing from one room to another: some colors or shades must remain common to the hallway and the living room or the hallway and the kitchen. Marbles such as Thassos, Light Emperador, Tundra Gray, Volakas, Calacatta - all polished - are products that fit perfect for decorating a larger flat or huge residential property. Polished granite, polished limestone, brushed or natural slate are just as many materials that spread elegance and style in hallway decoration projects. For special touches, we recommend floor square cufflinks, which create a flooring contrast, but they also become chromatic bridges with the rest of the room. Unless we are looking for the standard accepted in the Renaissance Courts and we want something more intimate, even large hallways can benefit from the atmosphere of the traditional and the Mediterranean environment. The solutions can floorings made of: Classic Cross Cut Brushed Travertine, or Classic Cross Cut Brushed Travertine, Mini French Pattern Set, Yellow Cross Cut Brushed & Chiseled Travertine French Pattern Set or any other product with honed surface and chiseled edges. Although still slightly used in Romania, another way to "warm" the space of a large hallway is the use of polygonal stones for flooring, but also for a wall. Of course, from a hallway cladded with polygonal stone, we cannot make a marble cladded living room unless ... we have the same color in the living room. Risky, unconventional, but doable. 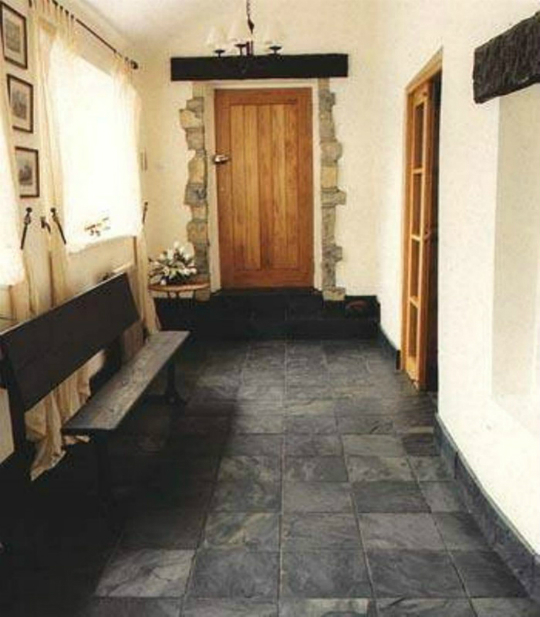 Example: Kavala Polygonal Slate for the hallway and a white-dominated living room and a few spaces where Kavala Slate Riven claddings can be used. You just have to look for harmony. And because there are so many natural stones, it's impossible not to find the best combination. No matter how large the hallway is, it should not be entirely cladded with a single type of stone. Leave at least one wall cladded with stone of another color for creating a balance, a contrast. Use light spots carefully. Natural stone makes a fine impression when it is well lit. There are natural stone products that need a light bath, but many are amazing when they are discreetly and close by illuminated due to its different insertions from one stone to another. 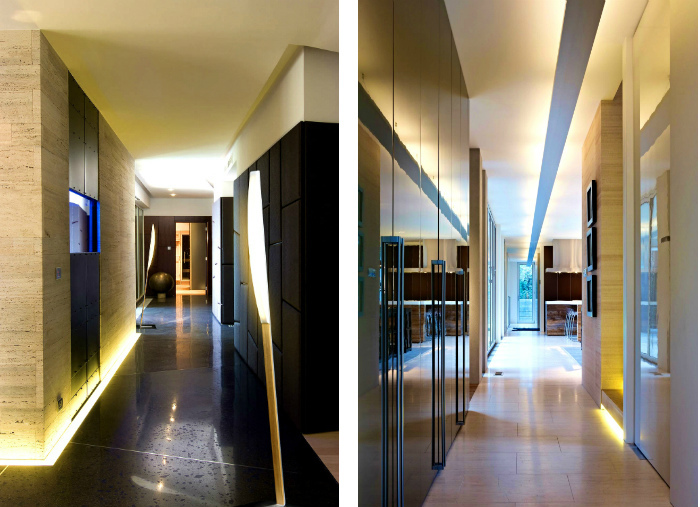 The decoration project for a hallway is exactly where the light will best grasp the stone. What to do next: be careful about the mirror frame for the hallway, the door jambs, sometimes you can create a border around the natural stone doors, thus creating a greater chromatic harmony in the hallway decoration project. Do not cover the flooring with a carpet after cladding it with natural stone: it's as if you have invested in a super sport car and you keep it covered with a dust wrap in the garage. 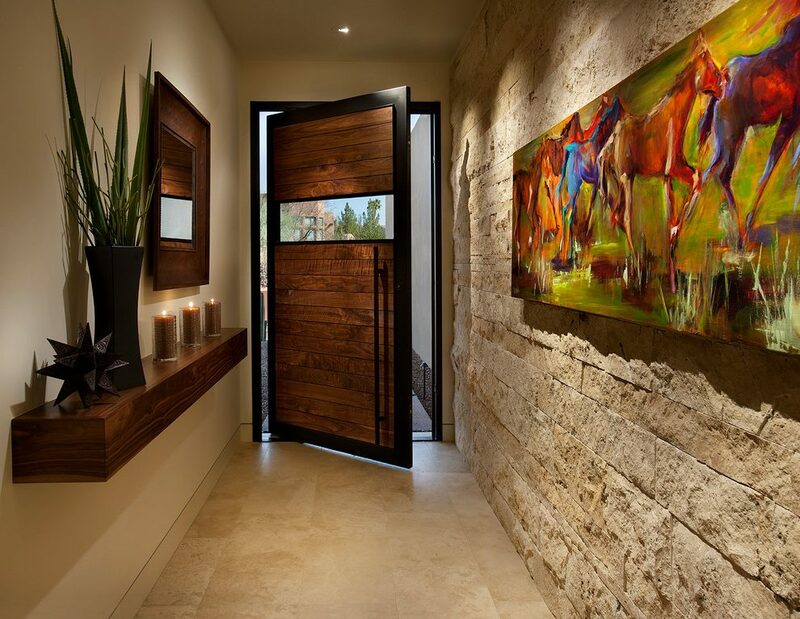 Never clad the wall of hallway with natural stone and then install top-down cabinets, thus filling up the hallway and covering such a beauty of stone. For this situation also stands the comparison with the super car kept in the garage. For further decoration ideas please get in touch with us by phone +40318.222.333 or email: export@piatraonline.com.